Ribonuclease Inhibitor (RNH1 also known as RI) is a ubiquitously expressed 50 kDa leucine-rich repeat (LRR) protein. It binds to and inhibits ribonucleases such as RNase A, RNase 1, eosinophil-derived neurotoxin (EDN, also known as RNase 2) and RNase 4. 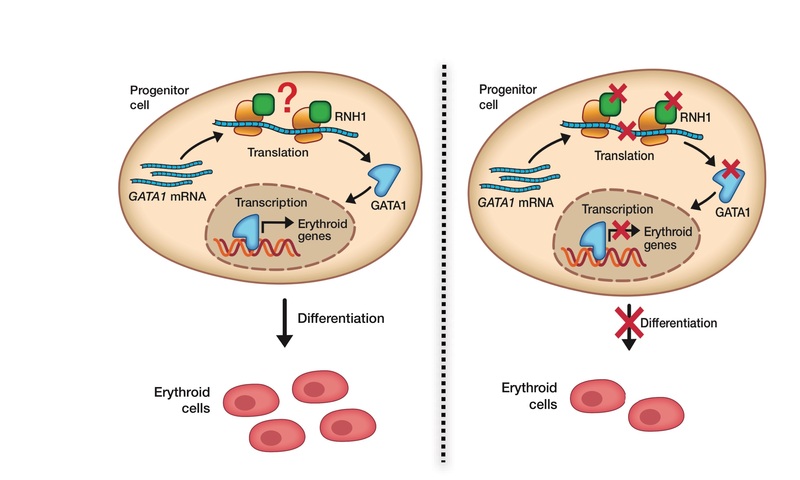 We recently published that RNH1 is a novel ribosomal associated protein, it binds to ribosomes and regulates erythropoiesis by regulating the translation of erythroid specific transcription factor GATA1. These findings reveal an unsuspected role for RNH1 in the control of GATA1 mRNA translation and erythropoiesis (JCI, 2018). Currently, we are interested in understanding the molecular mechanism of RNH1 in translation and Haematopoiesis. Interestingly, the LRRs of RNH1 are very similar to those of NLRP proteins. NLRP proteins belong to NOD-like receptors (NLRs) family and form inflammasome complexes. So, we are also investigating the role of RNH1 in Inflammation. The fundamental aspects of this research will provide a better understanding of the RNH1 in haematopoies and inflammation. In addition, such knowledge could establish the molecular basis for the development of novel therapeutic strategies for inflammatory and hematopoietic disorders.